I didn't see a thread about this yet. In honor of .hack's anniversary and Last Recode, there is a new web novel telling the story of the first 4 games from Kite's perspective. It's called 新約小説「.hack」 (New Novelization ".hack") which isn't a very exciting name but it contains some interesting tidbits. I'm not going to translate all of it, but I thought I'd share what I find while skimming it, and there are a few parts I did want to translate. -He had traveled from Berlin to a country town near Nuremberg to visit her gravesite. There's still no sense of if this scene is a flashback or happening during 2010. -Creil Air Base: F1C fighters' networked autopilot programs refuse pilots' commands and enter the same landing route, causing a collision. -St. Louis: Locomotive's speed indicator malfunctions due to errors in the networked control system, causing driver to speed the train up, launching 4 train cars off a curve and into the Mississippi River. 21 dead, 75 injured. A rare tumult and commotion filled the Oval Office. The 44th President of the United States, Jim Stonecold, listened as report after report was brought in. Since being inaugurated to his post seven years ago, his record included creating the World Network Council (WNC) and drafting bills relating to the Internet. He tried to adapt the rapidly growing Internet to the needs of the country so aggressively that he was derogatorily called names like "Net General." He was supposed to have succeeded. But, what was happening now? The net fell silent, communications ceased, accidents multiplied, and no one could grasp the whole picture. Voices cried out this and that. It was as if this room where the best of the best were supposed to be assembled had turned into a Babel. "It looks like a virus infection"
"Ridiculous, a virus during this immaculately clean Administration. The Director of National Intelligence approached him. "Could anything be more awful than this?" "The automated retaliation missile system is active." The Director's words silenced the Oval Office. "Impossible, how could this happen?" "The computer concluded that the government was under attack and had been destroyed. It is preparing to launch against hostile nations." "We can't issue the order. Our communication system itself is dead." Unbelievable. Of all things, for something like this to happen during his tenure. It was so directionless his head wasn't able to process it. Who would do such a thing? Who should we make it? Also Tokuoka is in it! Makes me glad to see Tokuoka back in action after all these years. Is he just slyly saying hello to Kite? Location: Harald in the R:2! Whoa, whoa, whoa! 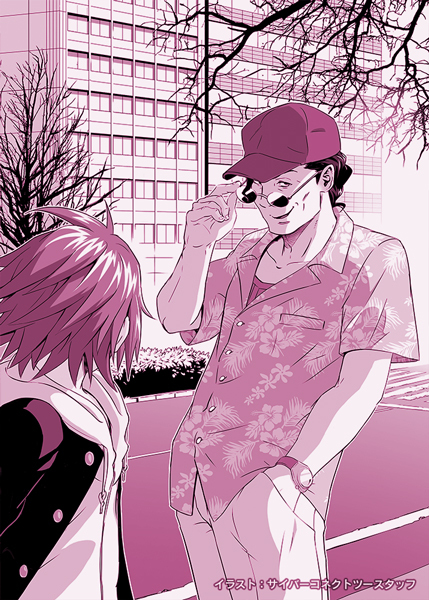 Tokuoka met Kite's player at some point?! Like c'mon. Tokuoka was mentioned by description in Another Birth, but neither Black Rose nor Mistral (who had mentioned him off-hand) actually met the guy. btw. Vol.2 is upon us. They dropped Chapters 23-27 yesterday and now the chapters are under their own seperate Vol.1 / Vol.2 tabs! I'm glad they're speeding along. Hopefully this one actually gets a physical release! I would love to see .hack in book stores overseas again. Nothing brought me more joy when I was younger than to go to my local store and see yet another new .hack novel or manga. I'm working on translating this entire novel on my .hack//Translate website. We shall find out so much from this. Veronica Bain also gets mentioned. Its possible Outbreak could be done within the next 2 weeks (main storywise its pretty much the shortest of the bunch), leaving 5 others to get through Quarantine if they want this to end just as Recodes being released. Probably not but it should for sure wrap up before the end of the year! I wonder how much into irl Kite they're going. Do we get to know his family and offline friends, his exam results, and other things like Another Birth did for BlackRose o.o? Is it safe to say that this novel is no longer canon? I dunno if this was it supposed to be canon in the first place? Its just another retelling of a story that was told a buncha times already. Introducing new stuff an going its own path was prolly the only way to keep it interesting. An they get some marketing for Last Recode outta it to. Getting close to that release date an suddenly "Look its everyones favorite Skeith! And motorcycles! Wouldn't it be fun to play a game with those?"! The G.U. novelization very much went its own path. G.U.+ and XXXX were their own things to. Heck, XXXX already showed us RL Kite years ago! Maybe a Link 2 will come along an throw this version of the story a bone like it did those others. It's actually Skeith Zero, the combined form of the Phases seen in ZERO and referred to here by Helba as "The 'Origin Terror,' the Eight Phases's primordial... zero" It's Morganna's final effort to stop them. Not exactly canon to the games, but about the same as Corbenik's death throes and fits into the existing universe. Plus that picture is awesome. So this is after Corbenik's been defeated? (Speaking of such did she still have her //LINK death speech in this?) Honestly, that makes a lot of sense since this is likely what //ZERO was meant to be leading up to (and what the //ZERO is probably referring to) I would guess that they planned for something like this in the original sense but scrapped it for one reason or another, ending the game with a Drain Heart session on the party before Aura sacrifices herself. Yes, this is after Corbenik was defeated. Things appear to be unfolding a little differently. An just like that its over O.o? My estimations were way off since Vol.3/4 were like a 1/3rd shorter than the first two. Whats up with that?